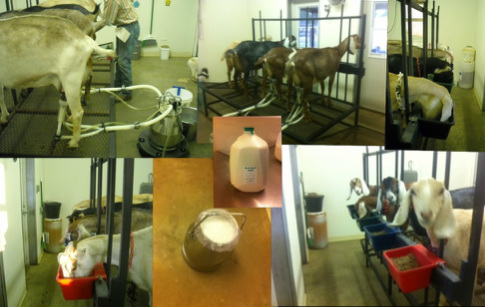 Because our milk is raw, the utmost care must be taken in the handling process beginning with healthy, well cared for goats, thorough cleaning of udders and teats before milking and sanitary processes for bottling, cooling and storage of the milk. As our does enter the milk parlor they are thoroughly washed before the milking equipment is attached. We wear gloves throughout the process and wash our gloved hands in bleach water before touching each doe. The milk goes directly into a sanitized stainless steel canister. The canister, once full, is then moved into the commercial kitchen where the milk is filtered, bottled and packed in ice. A goat’s body temperature is approximately 102 – 103 degrees so the milk starts out quite warm. Health Department requirements are that the milk be cooled to 40 degrees within 2 hours of milking. We attain that goal in about an hour. The filled milk jugs are then transferred to a commercial cooler for sell. Please pre-order milk. Our goal is to sell all milk within 24 to 36 hours of it being produced. You may call, text or email to place an order. We use single use plastic jugs that are inspected and approved by the health department. Be sure to bring an ice chest in which to store your milk while transporting. 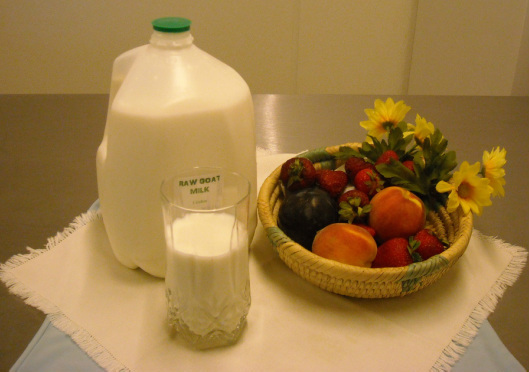 Raw milk is a living food – to maintain the integrity of the milk and its flavor it must be kept at a cold temperature. If you leave the container open and at room temperature you will notice a change in the flavor.